Quote: They Sell MORE !!! Advice: TAKE YOUR TIME !!! 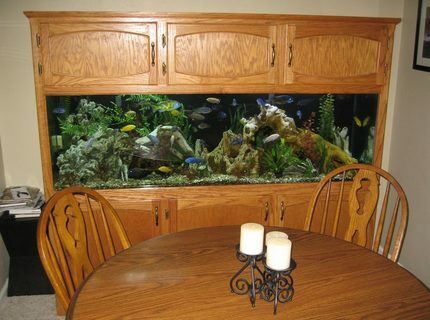 Advice: So the most important is a good filtration, not too much feed , and want your fishes . Quote: This is the last tank I'll ever have. Until the next one. Corals/Plants: Crushed coral substrate. Artificial plants. 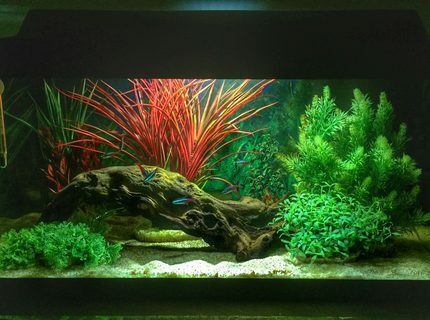 Advice: After 20 years of doing this, I've learned that if you ask 100 people what the best way of doing something is (filtration, lighting, water chemistry, ect) you'll get 100 different answers...and they might all be correct Plan your project before you start, have a vision for your tank and be patient. The final product might take months to achieve. Mistakes can be expensive, but don't give up. 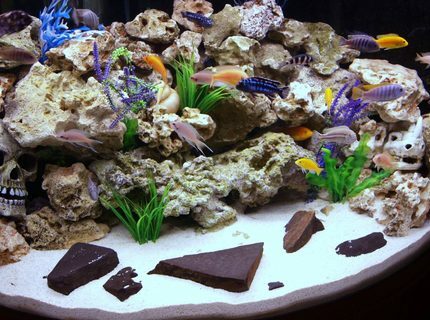 Read, read, and read about the fish you want to keep and their natural biotope. 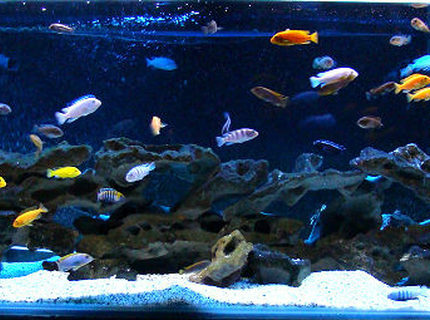 Cichlid tanks can, and probably should, be "over-populated" to dilute their natural aggression. Everyone gets chased equally. 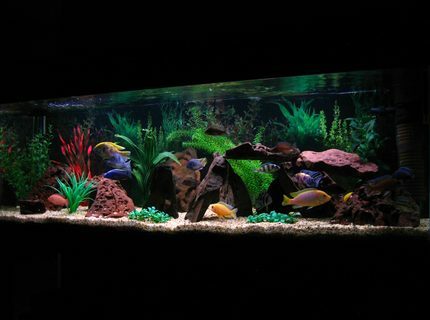 IMHO, frequent water changes, particularly in a large aquarium, are overrated once a clean tank is established. I only add water to top off the tank, and rarely do significant water changes. My water chemistry stays stable with no detectable nitrates and my fish are breeding. Filtration is the key, but whether you use biologic, chemical, mechanical, or whatever combination thereof does not matter as long as you have enough flow to maintain a stable system. Algae in an aquarium is an inevitability. Algae control is the name of the game. Get it to grow where you want, ie out of site, and not where you don't. Nerite snails are the best (even if you have a live planted tank--they don't eat anything but algae). In my tank, I allow a constant algae bloom in my refugium. My LED up top is excellent for fish viewing, but not so much that it fuels algae growth in my deeper tank. Quote: If its not broken, don't fix it! Advice: Take your time - there is no rush. Study as much as you can on your fish. Not ALL fish can go together. Get the biggest tank you can! Good planning is all worth it in the end. 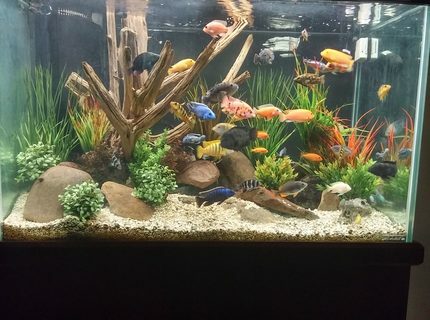 I've had reef, planted and all things in between, cichlids have been the best I've kept. Quote: Fish are friends not food!! About Yourself: Have been into the hobbie all my life as my father had fish. 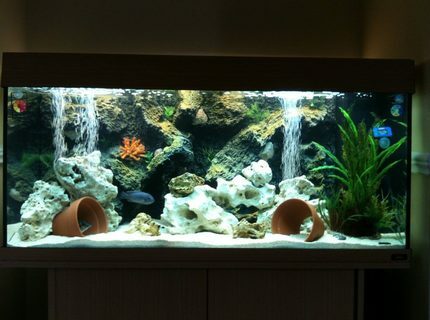 Got my own fish tank when I was around 14 so I've been in the game now for over 15 years. 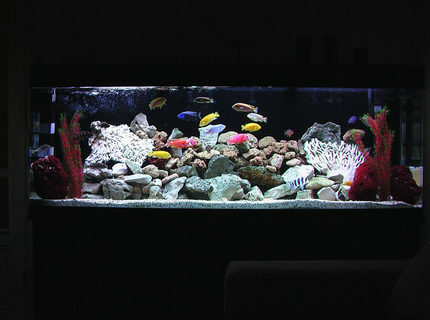 Fish Kept: Venustus, Blue Dolphin, Dragonblood, Mbumba, Demasoni, Frontosa, Livingstoni, Red Forest Jewell, Electric Yellow, Electric Blue x 2, Clown Loach, Bristlenose Catfish, Red Zebra, Cobalt Blue, Red Top Zebra, Eureka Red Peacock, Red Empress, Marble Peacock, Hajomaylandi, Acei, Latafasciata, Firebird Peacock. Corals/Plants: Plastic plants with lots of Womera rocks (Australian) as caves for my fishies. Advice: Filtration is the key to winning the battle! 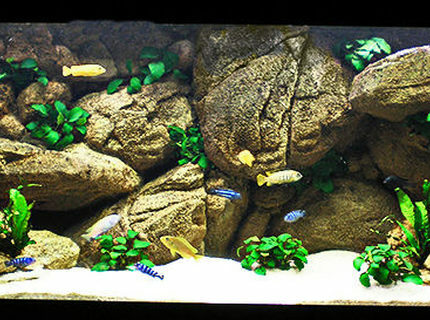 Description: My 5ft African Cichlid tank. About Yourself: I run this tank with my dad and we fall out about who makes it look the best! so we have both posted pics of our set up on here and then we can let you all decide which looks best. 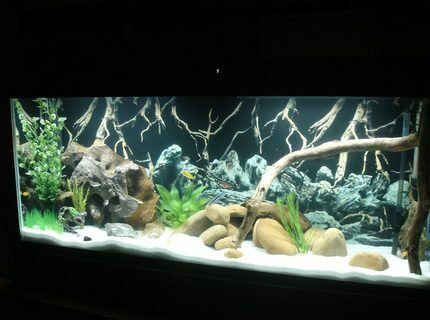 Fish Kept: Around 30 mixed malawi, plus a few clown loaches and catfish to keep on top of all the fry. Advice: Dont listen to most of the advice you get in the stores as most are just tring to get your money! Providing you keep on top of water changes and vacuming debris there is no need to constantly be adding chemicals and changing expensive filter media. I run 2 filters and and clean 1 every 2 weeks so they each get a clean every 4 weeks but i always change about 30% of the water each week. A good tip is to not to throw away carbon after it has been used but dry it in a low oven overnight then it can be reused time and time again. This all seems to work for my tank and i always have clear non smelling water and have had no disease yet and very rarely lose a fish.